Chris Kerr is the oldest bespoke tailor in Soho, now in its 56th year and third generation of Kerr family involvement. The business was established in 1960 as Len Wilton at 52 Berwick Street, where it remained for 50 years (eventually moving to 31 Berwick Street in 2010). In 1963 a young Eddie Kerr joined as an assistant cutter and by 1970 had been made partner, eventually buying the business outright in 1990. In the early sixties ‘Mr Eddie’ as he became known by customers began to make bespoke suits for the new pop & fashion scene emerging around Carnaby Street including stars like Matt Monroe, Procol Harem & The Swinging Blue Jeans. 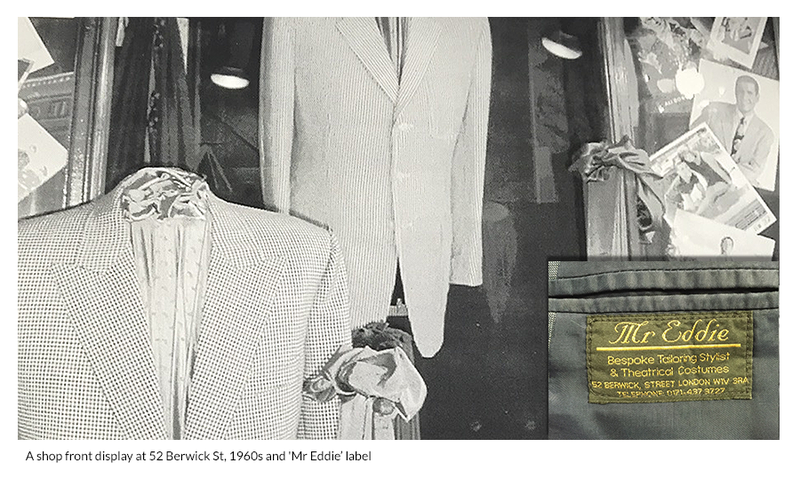 Over the next 4 decades, Mr Eddie continued to build on his reputation as the ‘go to’ bespoke tailor for creative people including many in the film and TV business. Some of his more famous commissions include cutting the coat worn by Richard E Grant in ‘Withnail & I’, blazers for the film Chariots of Fire and U2’s lemon suits for their Zooropa tour. In 1997 Mr Eddie’s son, Chris Kerr joined the business as an apprentice cutter under his father’s tutelage and took over the business when he retired in 2002. Continuing in the showbiz tailor tradition, Chris has cut suits for such stars as Brad Pitt, Johnny Depp & Nick Cave. A third generation of Kerr’s, Chris’s nephew Sam joined the business as an apprentice cutter in 2013.